Being reliant upon your local bike shop for simple problems can cut into your leisure time and enjoyment, and also unnecessarily dent your wallet. Many of us have to "get our heads around new I.T. technology". By comparison, a bicycle is not Rocket Science. Alas, too many cyclists are reluctant to learn simple bike adjustments which are easy peasy, 'cause a bicycle relies on basic mechanics which as kids, many of use understood. * During the initial 500km of riding a new bike, the rear gear cable will stretch marginally whereupon the rear gears won't change as smoothly. It takes 10 seconds to turn the Adjusting Barrel on the rear cassette one tenth (approx) of a revolution anti-clockwise to tighten the cable which will drag the rear derailleur arm, and therefore the chain, a tad towards the rear wheel, thereby realigning the rear derailleur over the correct cog in the rear cassette. Equally, the gear cable to the front derailleur will also stretch. Alas, there is no Adjusting Barrel on the front derailleur. However, there should be a Fine Tune Adjustment Knob at the top of the Down Tube for both the front and rear derailleur. If when straddled over your bike in the cycling position, you turn the Fine Tune Adjustment Knob (on your left hand side) anti-clockwise it will move the front derailleur to the outside thereby enabling you to shift to a larger chain ring easier. It will also move the cable away from the inner side of your front derailleur if it is touching it when in your lowest rear cog. If you are able to find a friend to pull the front derailleur twds the outside (against the spring loading), you will find it much easier to turn the Fine Tune Adjustment Knob. * If your chain comes off on the inside or outside when changing your front cranks, it only takes a minute to correct the inner and/or outer limit of movement of the front derailleur with a slight tightening with a small Phillips head screwdriver of one of the two small adjuster screws, and possibly also tighten the front gear cable ever so marginally. Learn how your front and rear deraileurs operate, as they are straight forward and easy to adjust. 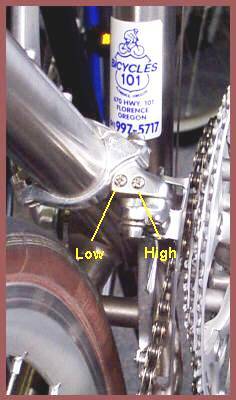 Two small screws control the limits of the front and rear derailleur movement [See Limit stops - High gear - Low gear in upper rear derailleur pic and Low and High Phillips Head screws in RH pic. A knob controls the cable tension. It is that simple. Equally, ensuring that a brake pad isn't pressing against a rime and truing a bicycle wheel are both easy tasks. Lift the wheel off the ground, spin it and observe if the rim moves closer or further away from the brake pad as it rotates. If a brake pad is pushing against a rim, twist the brake calliper away from the rim, so that the space between each brake pad and the rim is 3mm or 5mm. Then tighten the bolt which is securing the rear brake to the frame. The clearance between the brake pad and the rim should be between 3mm and 5mm. If the clearance varies outside this range at a particular section of the rim during each rotation, tighten (with a spoke adjuster) the two or three spoke(s) opposite the wider section, half a rev, a rev or even more (depending on existing tension) to pull the rim across to correct the distortion and bring within the recommended 3mm to 5mm clearance. (iv) tyres which should be in good condition and inflated to the air pressure as written on the tire sidewall – usually around 110 psi for 23mm road tyres and lower pressure for wider tyres. Decrease the pressure up to 20psi on a wet day for better traction. Check the tire tread and sidewalls for cuts and bruises. (b) Make sure your handlebars and seat are not loose. (c) A badly adjusted derailleur can cause the rear wheel to suddenly lock. (d) Investigate any rattles or noises. (e) Clean your chain drive as cleanliness reduces the destructive wear which grime causes. A clean chain drive will also protect your clothing from stains and makes your bicycle easier to pedal. Select a quality lubricant designed to reduce grime attraction. Wipe the chain down after lubrication so the outside of the chain will not accumulate grime. (f) After cycling in the rain, allow your bicycle to dry completely and revitalise your chain and rear cassette with a few drops of chain lubricant as you spin the rear wheel.